I had some leftover 125% Levain from Hamelman’s 5 Grain Levain (or 8 grain in my case) and I didn’t want to throw it out. I figured out a quick 1-2-3 recipe but the amount came out to be too much for my batard banneton. So what to do? I could use my bigger round bannetons but that means that I have to dig out my larger cast iron pots to bake the loaves and just didn’t feel like doing that. So I thought that I’ll use a loaf pan. Thanks to Dabrownman posts on figuring out how much dough to fill loaf pans, I calculated how much more flour and water I needed to add to my 1-2-3 recipe to fill 2 loaf pans. I kept the recipe basic (flour, water, salt) so that my daughter could eat it on her very strict diet. I didn’t sift out the bran, just milled the flour and made dough with it. Note that I didn’t measure the individual grains. I just kept adding various grains until I had 490 grams. I know I put a fair bit of Kamut in there and lesser amounts of rye and Einkorn. Mix flours and water in a mixer until you have a shaggy dough. Autolyse for 1 hour. Add salt and Levain. Mix on speed 2 for about 8 minutes. I made the mistake of putting the Levain in the bowl before the autolysed dough and it just spun in the bowl for quite a while before I noticed. I had to keep stopping the mixer to fold the dough around the hook. Do 4 sets of folds 30 minutes apart. I felt the dough was dry so I kept adding bits of water with my hand after the folds. I let is absorb while it was resting between folds. It came probably to a handful in the end. Continue with another 2 sets of folds but one hour apart. Then after the last fold, place in the fridge for a couple of hours. Divide into two equal portions and loosely shape into a batard. Let rest for 45 minutes. Do a final shape to fit into the loaf pans. T J Wilson has a great video on how to shape for a loaf pan and I used the same technique. Cover with a damp cloth and let rise until the highest point of the dough is one inch above the rim of the pan. Or at least that was the plan. Someone forgot to tell the dough. Three hours later, it had reached the edge of the pan and seemed to just hang there. The poke test indicated that they were more than ready. So being midnight, I baked them. Preheat the oven to 425 F with a pizza stone on the middle shelf for 45 minutes. Get some kind of steaming apparatus ready. I use wet washcloths in a sheet pan. And we were very bad! We tried to wait to cut the loaf but that lasted all of 5 minutes, if that! Nothing like warm bread with butter and homemade jam! The crust is very thin and crispy. 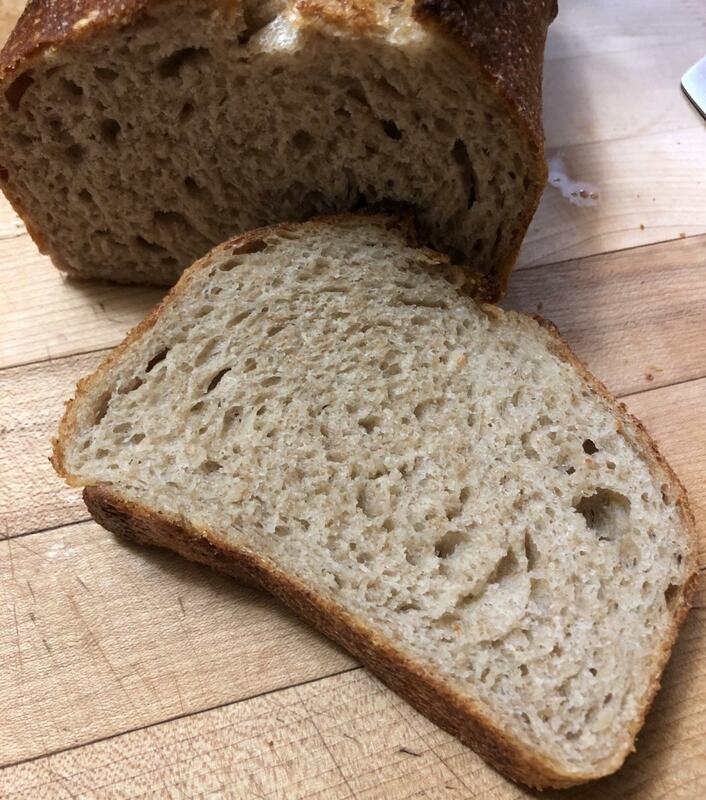 Crumb is tender and delicious. Not bad for a spur of the moment loaf. Nice work - or was it pleasure? As to being bad and slicing right away - I'm sure aroma and curiosity were irresistible temptations. I've always believed that a temptation that could be resisted wasn't much of a temptation anyway. My wife would love those pa breads! I have her hooks on SD multigrain pan bread a a 50% whole grain one would be perfect for her! Perfect for sandwiches...Very nice indeed Danni! it was a quick one to throw together. I didn’t even sift or soak the bran. It’s perfect for sandwiches or toast and it tastes great due to the fresh whole grain flour. Can’t get any fresher than that! I milled and used it! Lucy needs to give this one a shot. Sorry I can tell you how much of each grain there is in there, I just opened my buckets and started scooping all in the same bowl until I got what I needed. Danni, those are great, t he crumb looks yummy. They must've gotten lost in the flurry of Hamelman activity. You're so clever in putting things together.